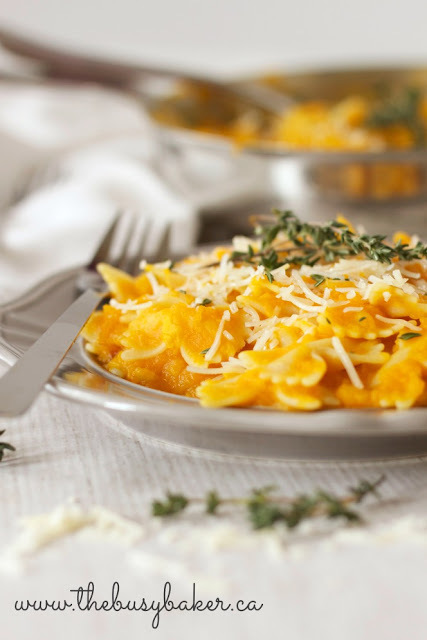 Butternut squash pasta is the perfect comfort food dinner. 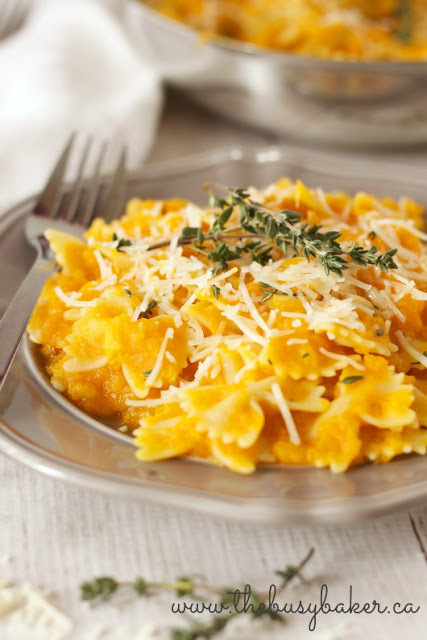 The butternut squash pasta sauce is creamy and rich, but low in fat and calories. A delicious meatless meal or side dish. My husband bought me two cookbooks for Mother’s Day this year and I’ve completely fallen in love with them. I know you’re probably thinking cookbooks are an unromantic gift, but I’m definitely the kind of woman who appreciates getting a new toaster for Christmas or an immersion blender for my birthday (both are true stories!). One of the cookbooks I received was Jamie Oliver’s Comfort Food and I’ve really enjoyed cooking out of it because the recipes are simple, so delicious and easily adaptable. 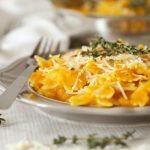 This Butternut Squash Pasta is a recipe I’ve adapted from one of Jamie’s; I put my own spin on his butternut squash pasta sauce and it is SO good! It’s creamy and delicious and the perfect healthy dish. 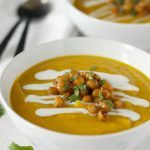 I know you’re going to love it as much as my Butternut Squash and Red Lentil Soup…maybe even more! Looking for more squash recipes? Try this Italian Sausage and Brown Rice Stuffed Acorn Squash or this Butternut Squash Pasta Salad with Cranberries, Pancetta and Candied Walnuts. 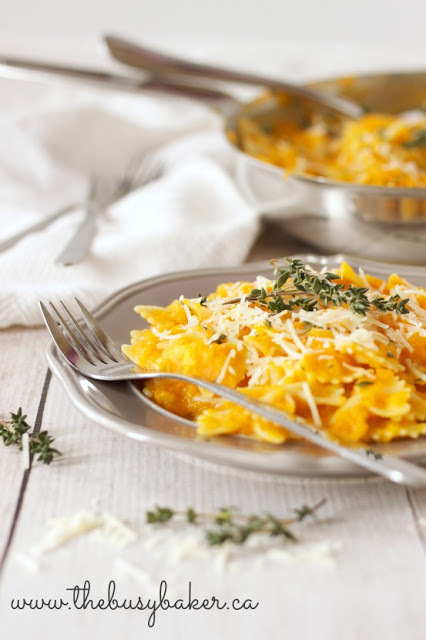 This butternut squash pasta recipe is adapted from Jamie Oliver’s Gnocchi and Squash Sauce recipe, from his Comfort Food cookbook. I simplified it by replacing the homemade gnocchi with whole grain pasta, I also adapted the butternut squash sauce to my family’s tastes and made it Weight Watchers-friendly. I hope you enjoy it! One of the healthiest parts of this pasta dinner is the butternut squash pasta sauce. 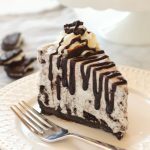 It’s vegan, gluten free, Weight Watchers friendly, and requires just a few simple ingredients. The addition of Parmesan cheese creates a perfectly balanced dish as the sharpness of the cheese is the perfect contrast to the smooth-tasting sweetness of the butternut squash sauce. If you want to make the butternut squash pasta dinner completely vegan, just omit the Parmesan cheese garnish on top, or use a vegan cheese of your choice. 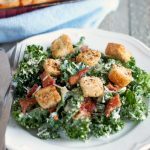 This recipe makes the perfect side dish to serve alongside grilled chicken or pork chops, but it also makes a filling vegetarian meal all on its own. This recipe makes 6 large servings at only 7 Weight Watchers PointsPlus per serving (there are 40 PointsPlus in the entire recipe) and it’s packed with healthy ingredients, so it’s really a great fall meal to help you stay on track. Want more pasta dinner inspiration? 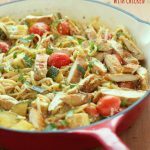 Check out my recipes for Creamy One Pot Chicken Enchilada Pasta and Easy 15-Minute Pasta Carbonara. I hope you enjoy this butternut squash pasta recipe! Let me know in the comments below, what’s your favourite way to enjoy squash this season? 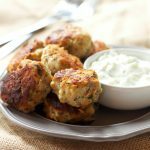 Gorgeous recipe! I love using winter squash in sauces like this. 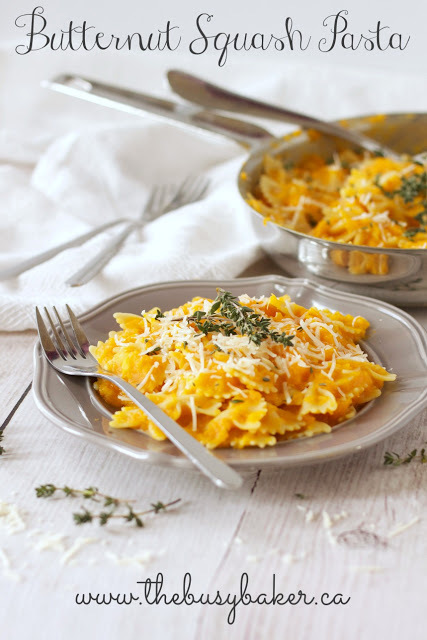 I have been wanting to try butternut squash with pasta for a while because it looks so good! Yours is no exception – yum! I wish I had some now.. for second dinner! Haha! This looks right up my alley. I wish I could have something like this to eat for lunch right now! What a beautiful fall dish! I love pasta with seasonal veggies! Love using squash in pasta recipes!